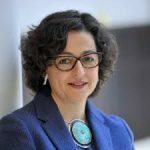 Arancha González, an expert in international trade issues with 20 years of experience, serves as Executive Director of the International Trade Centre (ITC) since September 2013. Ms. González, a Spanish national, has extensive knowledge about international trade and economics, coupled with broad experience in trade and development matters in the public and private sectors, as well as in management at multilateral organizations. Before joining ITC, Ms. González served as Chief of Staff to World Trade Organization (WTO) Director-General Pascal Lamy from 2005 to 2013. During her tenure at the WTO, she played an active role in launching the WTO’s Aid for Trade initiative and served as Mr. Lamy’s representative at the G-20. Ms. González began her career in the private sector advising companies on trade, competition and state-aid matters. She served as an associate at Bruckhaus Westrick Stegemann, a major German law firm, in Brussels.